Many people have found the cable sold in parts stores for 1980’s Chevy and GM 6.2L diesel powered vehicles does not fit correctly. 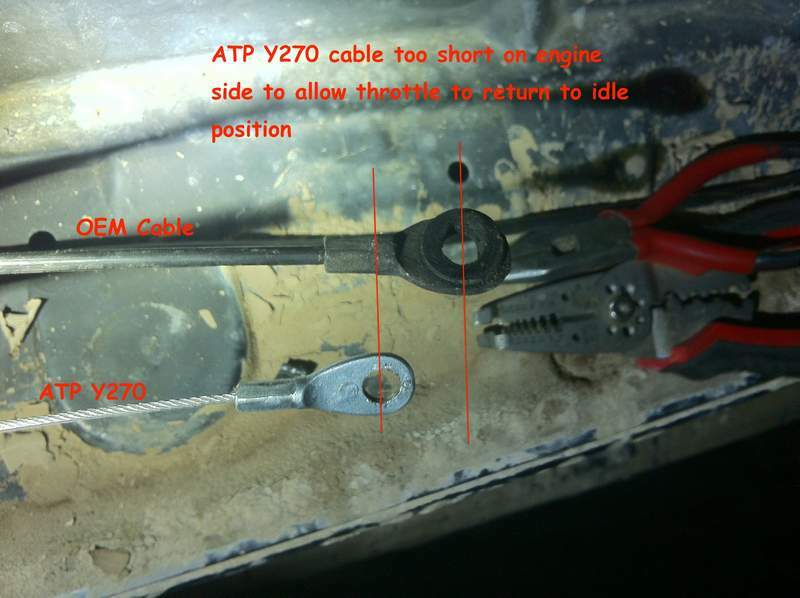 Both the Pioneer CA8503 cable and the ATP Y270 cable claim to be the correct fit for the application, but will not allow the throttle to fully close.The image below shows the aftermarket cable compared to an original gm cable. It is about 1″ shorter than an OEM cable when the cable sheaths are lined up. Although these cables do not work out of the box, they can be made to work without much modification. 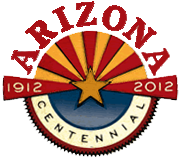 If you had trouble with this cable fitting, please contact Pioneer using the below link and let them know. If enough people mention the problem Pioneer may correct the issue (its a simple fix) and make cables that work straight out of the box. Both cables are the correct overall length with the correct end fittings so they can be modified to work. The on the gas pedal side of the cable there are two pieces of metal crimped onto the cable. 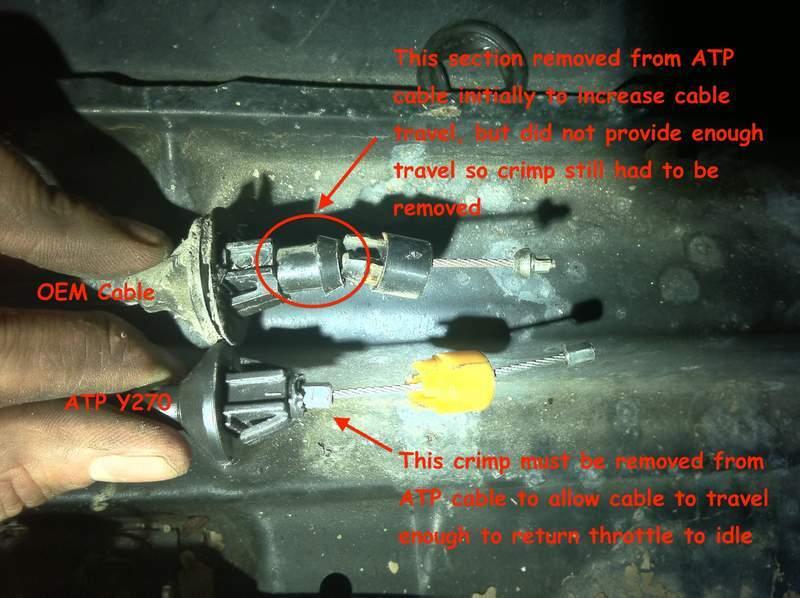 The crimped piece on the engine side of the plastic clip (the piece that pushes into the hole on the gas pedal) needs to be removed, increasing the amount of travel in the cable. This will give enough travel in the cable to allow the injection pump to return to idle. To remove the crimped piece use a file (or grinder if you are very careful) to wear down the piece until you reach close to center (where the cable runs though) and then carefully bend/work the crimp off the cable. Special care needs to be taken so as to not damage or cut the cable. With this piece removed, the cable will install and work just like the OEM cable. Try 15674368. It worked out of the box for my 1986 cucv pickup, with the one issue that it is a hair too long. This can be fixed by cuttong off the cable end at the gas pedal side, pulling the slack through, and crimping on a new endcap. Or you can use the redneck fix- just pull the slack through and crimp on a lead fishing line weight. No cutting needed. I actually tried removing the ferule from the pioneer cable, but couldnt do it using my small dremmel tool. Those are solid ferules, vary durable, and cannot be “bent” off. As I was trying to bend it, I felt cable strands snapping. Maybe using a confocal microscope I might have a chance. Do you have a source for 15674368? It appears to be a discontinued part.